Sometimes ISPs will block the standard listening port of FrostWire and you simply cannot seem to connect to other peers. Is is fairly simple to change the listing port, so it is worth the effort to change it if that sort of problem exist. Go to tools>options>advanced>Firewall and make the following changes. Click apply and ok. Completely terminate FrostWire and restart. 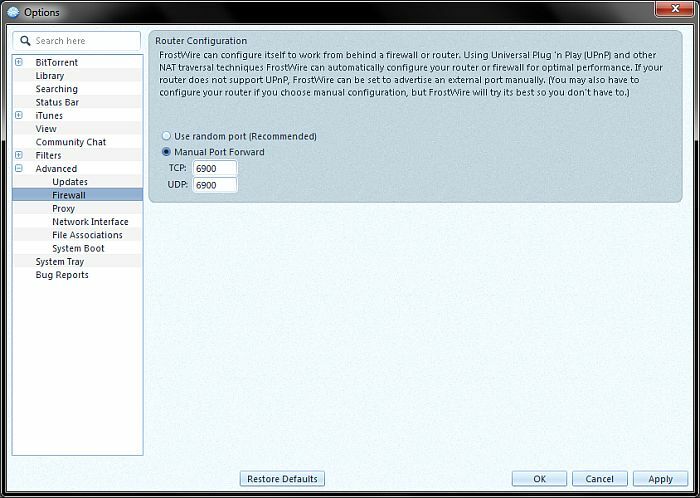 If you need to port forward your router, Do that before restarting, but if UPnP is working, it should be not problem.